A dozen children took some time this week to thank local law enforcement officers. Twelve youth, ranging in age from 5 to 12, worked with their parents on Wednesday to find a way to show support to the Johnston County Sheriff’s Office. Cynthia Fauci invited neighbors in the Flowers Plantation community near Clayton to stop by her home. 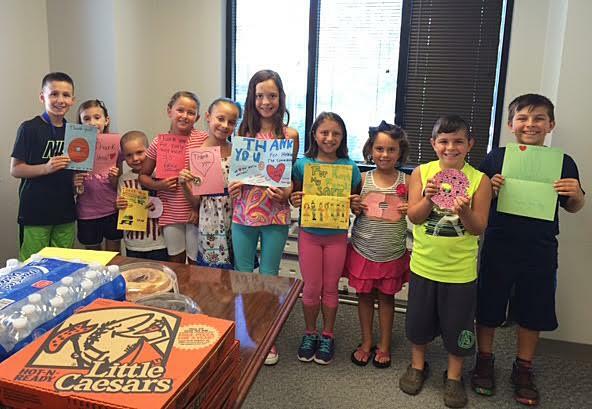 Children made homemade cards for the deputies while the adults bought pizza, bottle water and made a cake. Ten of the 12 children made the trip to Smithfield with their parents to present the cards and food to deputies at the Johnston County Courthouse. Lisa Bland said it was a way to say hello to the officers and to say thank you. “We wanted them to know we were thinking of them and praying for them. It was just to show our support.” Every single parent invited to participate in the event did so. Sheriff’s Captain Jeff Caldwell said the officers were very appreciative and thanked the youth by presenting them with junior deputy stickers.